In our recent post on Rubellite there were some follow up questions about the color of Rubellite. First of all different countries seem to have different understandings on the subject. The round stone pictured in this post may help us towards clarity. In almost any country other than the USA this stone, despite being pink, would be called Rubellite. There are country-specific perceptions regarding desirable color in gems and the names attached to them as well. Why some people would name this very pink gem a Rubellite is due to the type of tourmaline crystal that would produce this stone. Rubellite crystals tend to look different from other types of tourmaline crystals. In addition to a lighter color gem, as in this picture, a Rubellite mine will also produce darker Rubellite crystals–when a mine happens to be producing. 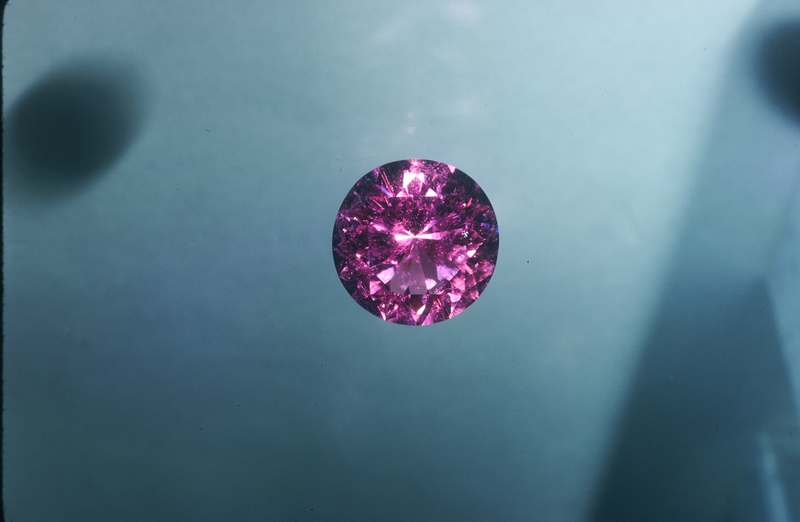 A pink Rubellite will generally be a more pure pink than other pink tourmaline gems. Almost all other types of pink tourmaline will have at least ever so slight to significant brownish overtones and have the possibility of being very clean to flawless. So it’s a choice of color vs. clarity. So far color has won—Rubellite has always been more expensive than pink Tourmaline. As we mentioned in the last post the darker color of Rubellite as compared with Emerald tends to obscure the inclusions so that many Rubellite gems do really show a lot of inclusions to the naked eye. As you can see in this post’s photo the lighter color does not cover the inclusions and they are quite readily visible. This entry was posted in Education, Gem Sources, Gemstone Spotlight and tagged Color in Gems, Pink Tourmaline, rubellite, tourmaline by John and Laura. Bookmark the permalink. I am proud to say I own alot of big beautiful rubelite some pure reds from Russia which I bought from an old collection, then Nigerian and Mozambique. I am extremely lucky my prized Laura Ramsey large rubelite rings are amongst my favorites. So glad to have found this blog. Bless u both and thanks for the years of knowledge u shared.